CASCA members and attendees must register for the conference through CASCA. For more information, see https://casca-aaa-2019.com/. Rates are available to all attendees, not just those submitting abstracts. Advance Registration (ends March 20), Standard Registration (ends Oct. 31), and Onsite Registration (ends Nov. 20). Registration rates do not include AAA membership dues; or food, hotel, or travel costs associated with attending the Annual Meeting. Standard registration rates include a printed program. Green registration rates do not come with a printed program. Instead, green participants will use our online program and personal scheduler to navigate the conference. Members: Discounted registration rates are a member benefit, and you must be an active AAA member at the time of registration to receive the discount. To check your membership status log into Anthro Gateway. You can join AAA online or contact the Membership Department at members@americananthro.org. For more information on membership rates, click here. Nonmembers: Non-anthropologists and anthropologists from outside of the US or Canada are encouraged to join AAA to receive the member discount and other benefits. If they do not wish to join AAA, they may request a Guest Presenter Registration (pricing below) if they intend to participate on the Annual Meeting program by submitting a proposal. For nonmembers who do not wish to join AAA or submit a proposal, nonmember pricing will be available beginning Thursday, April 11. Anyone wishing to submit a proposal for the Annual Meeting program must be a member of AAA or CASCA *AND* an Annual Meeting registrant. Any AAA attendee wishing to submit a proposal who does not wish to join AAA should read the nonmember note above to request a Guest Presenter Registration, formerly known as a Member Exemption. >> Available upon request for non-anthropologists or anthropologists residing outside of the U.S. or Canada. The request must be approved before the rate will show, and the rate expires on Wednesday, March 20. After this date, individuals must join AAA and pay a member registration rate in order to submit a proposal by the main Call for Papers deadline (April 10, 3 pm Eastern). In prior years, this was called a Member Exemption. Allows non-anthropologists and anthropologists outside of the U.S. or Canada to present at the Annual Meeting without joining AAA. Approval for this rate will lock the requester into the guest professional rate, a rate higher than what AAA members pay. Allows non-anthropologists and anthropologists outside of the U.S. or Canada to present at the Annual Meeting without joining AAA. Approval for this rate will lock the requester into the guest student rate, a rate higher than what AAA members pay. >> Student ID or other proof of student status is required at badge pick-up. Meeting Presenters/Participants: The registration fee is your commitment to presenting at the AAA Annual Meeting. If your proposal is accepted into the program, the registration fee is non-refundable. Under no circumstance will accepted presenters be eligible for a registration refund. 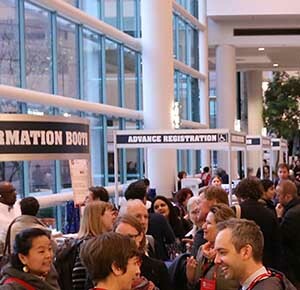 If your proposal is not accepted, your registration fee is refundable as long as you submit a written request to aaameetings@americananthro.org on or before October 21. No refunds will be granted for requests received after October 21, 2019, no exceptions. Meeting Attendees (non-presenters): All requests for refunds or cancellations must be made in writing. Between April 11 and October 21, a written refund request will be subject to a $25 cancellation fee. No refunds will be granted for requests received after October 21, no exceptions. Under no circumstances will AAA issues refunds for no-shows. Badge sharing, splitting, and reprints are strictly prohibited.